Trump has no plan for Afghanistan other than killing more terrorists. Trump’s Afghanistan speech gave little indication of how he plans to end America’s longest war. President Donald Trump delivers remarks on America’s military involvement in Afghanistan on Monday in Arlington, Virginia. 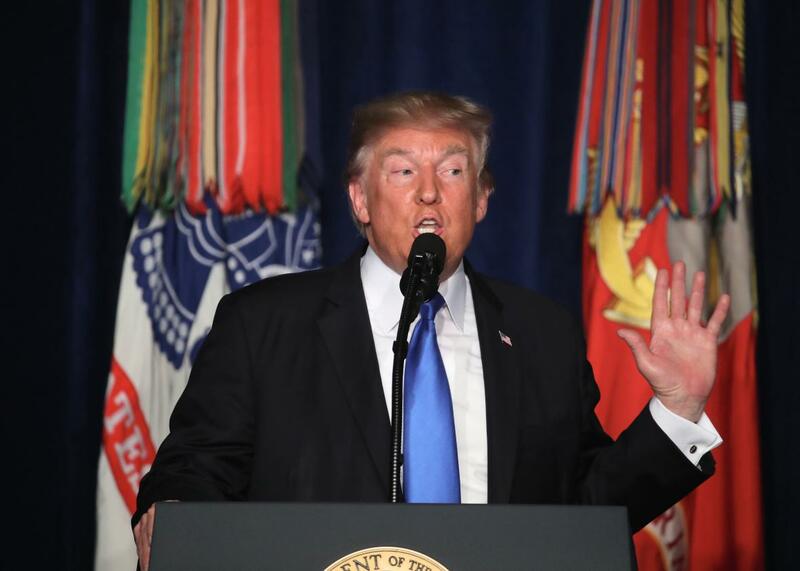 President Donald Trump’s speech Monday night on Afghanistan—his first prime-time address since his speech to Congress in March—contained a few good lines but no real substance. He billed it as the outline of “our path forward in Afghanistan and South Asia,” “a new strategy,” and “a plan for victory”—but, in fact, it was none of the above. “Victory will have a clear definition,” he promised. But that definition—“attacking the enemy, obliterating ISIS, crushing al-Qaida, preventing the Taliban from taking over Afghanistan, and stopping mass terrorist attacks against America before they emerge”—held little relevance for this war that has gone on for 16 years, the longest war in U.S. history. Strategy is the application of force to achieve political aims. The first three tenets of Trump’s definition (“attacking … obliterating … crushing”) amount to pounding an area with firepower. The next two (halting the Taliban and stopping terrorist attacks) are political aims. But nowhere in the speech did Trump lay out how the pounding might lead to the winning of the war and the settling of the peace. We have already been doing a lot of pounding in Afghanistan these past 16 years. Trump blamed the failures up until now on excessive micromanagement in Washington—too many rules about when, where, and how force can be used. He said he would lift those restrictions, let the commanders and the fighters in the field do what they think necessary. With this new freedom, victory will flow as freely as the lava from a freshly blown volcano. There are several problems with this notion. First, Trump didn’t say how many more U.S. troops he would be sending (on the rationale that he won’t let the enemy know what’s coming), but officials have been talking about another 3,000 to 5,000 on top of the 8,000 who are stationed there now. At the peak of the fight in 2011, there were 100,000 U.S. troops in Afghanistan. A few thousand more soldiers and Marines in full fury can’t wreak more damage than a restrained force 10 times larger (and, at times, that larger force fought with little restraint). So, on one level, his “plan” is impractical. Second, the looser the rules of engagement, the more we’ll wind up killing Afghan civilians. (Rules of engagement are put in place precisely to limit civilian casualties.) This isn’t just a moral issue; it goes to the heart of strategy. The Taliban, ISIS, and the other militias are waging an insurgents’ war. You don’t need to be an adherent of classical counterinsurgency theory to realize that insurgency wars are, in part, wars for the loyalty and fear of the people. You don’t win the people’s hearts and minds by killing a lot of them, however accidentally. If you kill insurgents in a way that also kills innocent bystanders, you create more insurgents, as the friends and relatives of the bystanders you killed join the insurgency or at least turn a blind eye to their organizing. Third, early on in the speech, Trump said his strategy would rely on the “integration of all instruments of American power—diplomatic, economic, and military—toward a successful outcome.” But he said little about those first two instruments—diplomacy and economics—and nothing about how they’d be integrated with the military campaign. Nor did he define “successful outcome,” except in terms of the enemy’s total defeat. But this isn’t likely to happen, or if it does, it won’t happen strictly as the result of firepower. He came close to admitting this. “Someday,” he said early on in the speech, “after an effective military effort, perhaps it will be possible to have a political settlement,” which might include the Taliban, “but no one knows if or when that will happen.” End of paragraph. Here’s a crucial point. Everyone knows—and has known from the beginning of this war—that it will end with a political settlement, which will include some faction of the Taliban, who are, after all, Afghans. All along, American commanders have put off this task until the Afghan army, backed by U.S. forces, is able to win more battles and win back more territory, so they can come to the bargaining table with more leverage. This has never happened: Even when we and the Afghan army have won battles, it hasn’t given us more leverage. This is a recipe not for swift victory but for never-ending war. There is another obstacle to success, however the term is defined: the weakness and corruption of the Afghan government. Local and regional warlords still rule much of the country’s territory, and to the extent the national authorities in Kabul get their way, it is often through bribes and kickbacks. All along, U.S. presidents and military commanders have said the Taliban and others will never be defeated as long as this remains the case. In a Senate hearing several years ago, Adm. Mike Mullen, then the chairman of the Joint Chiefs of Staff, said we could throw a million more troops into the battle and it wouldn’t make much difference as long as corruption reigned in Kabul. Trump made a big point in his speech in disavowing the idea of nation-building. “We are a partner and a friend, but we will not dictate to the Afghan people how to live or how to govern their complex society,” he said. This is a good point, but it’s also problematic. As long as the Afghan leaders govern their complex society in a corrupt way, they will not win over the people and they will not defeat the Taliban. And yet this is the hardest part about Afghanistan, something that Trump’s national security adviser, Lt. Gen. H.R. McMaster, knows well. When Gen. David Petraeus was commander in Afghanistan, he hired McMaster to run an anti-corruption program. It didn’t work. Now Trump is claiming a new way forward, a way toward a quick complete victory, without even acknowledging the problem. “We are not nation-building again,” Trump said, “we are killing terrorists. OK, but what is he going to do about the Afghan nation? And killing is only the beginning of winning a war. Trump also talked about the need to pull the Pakistanis into the right side of this war, to stop giving them money even as they provide safe harbor to our enemies. This is an important point, and it was something that Presidents Bush and Obama both understood but did little about. What will Trump do about it? He didn’t say. Nor did he show any understanding of why Pakistan behaves the way it does—for instance, its fear of encirclement by India, which has interests in Afghanistan. Nor did he say anything about the roles that Iran, Russia, and China are beginning to play in this strategic maze. It is doubtful that this speech will have much impact on its main intended audience—the American people, who must support continued funding of this war, with no limits on duration, if it is to succeed on any level. Trump acknowledged near the beginning of the speech that he had once opposed this war. “My original instinct was to pull out,” he said. “I like following my instincts. But all my life, I’ve heard that decisions are much different when you sit behind the desk in the Oval Office.” As he once said of health care, “nobody knew”—meaning he didn’t know—how complicated things were. The things Trump has come to realize are that we need “an honorable and enduring” outcome, that a “rapid exit” would create a vacuum of power, and that this vacuum will be occupied by terrorists who will plot against us, just as they did in the attacks of 9/11. There is something to this—although, as we’ve learned repeatedly in recent years, terrorists can find safe harbor in countries all over the world, including otherwise quite peaceful ones, so it’s unclear how Afghanistan is unique in this respect. In 2015, President Obama decided not to withdraw all U.S. troops from Afghanistan because of the security threats posed by various terrorist groups on the Afghan-Pakistani border—quite aside from issues involving Afghan security per se. It made sense to have a base for counterterrorism operations in the region; the new Afghan president offered to sign a strategic partnership agreement, something that his predecessor, Hamid Karzai, had never done. So, Obama reasoned, we might as well have a base in a country where the leader wants one. Trump wants to take this further, toward “victory,” but he is rallying neither the necessary resources—diplomatic, economic, or military—to obtain it, however it might be defined. Trump is not the source of these wounds, but he has clearly and deliberately been the chief agitator of the tensions he’s talking about, perhaps most brazenly in just the past few days, in the wake of the violence in Charlottesville, Virginia. No president can effectively persuade a country to step up a war abroad while he is so fiercely waging a war within.